US, 2006, 88 minutes, Colour. Amber Heard, Anson Mount, Whitney Able, Michael Welch, Edwin Hodge, Aaron Himelstein, Luke Grimes, Melissa Price. 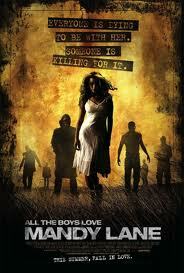 All the Boys Love Mandy Lane starts something like a teen romantic comedy. However, there is a dark side when a young man is drowned in a swimming pool after making advances to Mandy Lane. A year then passes and Mandy Lane (Amber Heard) is very popular at school but is a self-contained person, virginal and beyond the reach of boys. She still is great friends with Emmet, a young man on the outer (Michael Welch). A group is invited to spend a weekend on a ranch. They insist that Mandy Lane goes with them. The boys have sexual intentions, the girls preen themselves and have a touch of jealousy and comparisons. At this stage the film turns into a variation on Friday the 13th, a stalking killer who picks of the various young people with some degree of gore and brutality. It becomes a variation on the slasher movie. With people dying around her, Mandy Lane preserves her life, relying on the older caretaker at the ranch (Anson Mount). The audience sees that it is Emmet who is killing the young people. The film is of interest at the end with the unexpected twist, followed by another twist, with Mandy Lane surviving all the mayhem and not the person that audiences thought she was. The film was directed by Jonathan Levine who was to go on to great popular and critical success with the odd comedy, The Wackness. He also directed the comedy about a younger man dying of cancer, Live With It. 1. The impact of the film? Teenage romance? Turning into a slasher film? The twists? 2. The high school setting? School, parties? The contrast with the ranch? The episodes at night? The transition to the murders, the visualising of the murders, the touches of brutality? The mounting tension? 3. The focus on Mandy Lane, her charm, quiet, pretty? Her friendship with Emmet? His being a loner? The odd couple friendship? The death of the young man in the pool and the consequences? 4. The year passing, Mandy Lane and Emmet? Emmet still on the outer? The young people, their brash style, talk, vanity? Red and his invitation to the group to go to the ranch? Their insisting Many Lane went? How well did the film differentiate the different characters? The soap opera lookalikes? 5. At the ranch, Garth and his warnings about drugs, drinking? His supervision? 6. The boys, their attitude towards Mandy Lane? The sexual overtures? The behaviour of the young people – and the arrival of Emmet? Hooded? The Grim Reaper? 7. The episode between Jake and Marlin? His callous attitude towards her? The violence of her death, Jake and his going out to find her, the death in the dam? 8. The group in the house, Bird and his going out, his being attacked by Emmet? 9. Chloe, her vanity, talking with Mandy? The pills? Her going out with Red, Red’s death, her being pursued by the car? Being saved by Mandy? Mandy with the knife, the irony of Chloe’s death? 10. Emmet and his coming into the house, the blood on Mandy’s hair? Garth seeing it, his being shot? Mandy caring for him? 11. The revelation of the conspiracy between Mandy and Emmet? The madness in their murders? Revenge? The planned murder-suicide? Emmet and his plan, Mandy and her reaction, killing Emmet? Garth and rescuing Mandy, assuming she was the victim and the innocent? 12. The ironic ending as Mandy went off with Garth? How interesting a variation on the Friday the 13th/slasher kind of thriller?